"A Moment in our Arms... A Lifetime in our Hearts." Wolfgang Raymond Little was born to Camber Chantel Grandstaff and Justin Lee Little on January 28 at 8:55 pm at the Intermountain Medical Center, Murray, Utah. He was full term and weighed 7 lbs, 13 oz. After a 20 hour labor, he was delivered pink and healthy looking by ceaserian section. Wolfgang lived 25 minutes while doctors tried to get him to take a breathe. Cardiorespiratory failure was listed as the cause of death at 9:20 pm from complications of a faulty trachea. The preliminary autopsy showed the trachea, which is formed in the first trimester, to be soft and malleable rather than firm and solid. It was a shock to everyone. There was nothing Camber or Justin could have done to prevent this. This birth anomoly did not show up in the sonogram. Little Wolfie's mother attended every doctor appointment and ingested only that which would be healthy for her baby. In utero he had a strong healthy heart beat, and his mother loved knowing he was there, talking to him, telling him how much he is loved, and even allowing her 2nd grade students to feel his kicks. His father was not only there every moment of the labor, serving and anxiously awaiting his arrival, but was also there to see Wolgang's delivery. Wolfgang had big blue eyes and a full head of rusty colored hair with his Father's nose, chin, forehead, and his Mother's lips and toes. Camber and Justin cuddled him through the night grieving his passing. They together decided to donate his heart to Intermountain Donor Services at Primary Children's hospital where his heart valves will contribute to the lives of others. 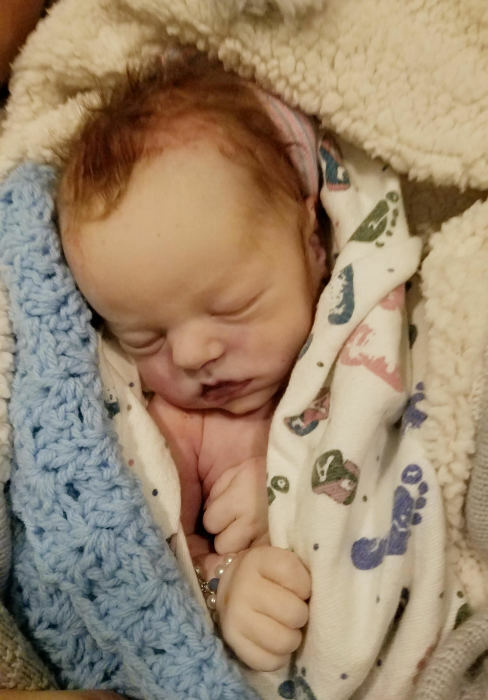 Wolfgang Raymond Little is survived by: Parents; Camber Chantel Grandstaff & Justin Lee Little of Salt Lake City and Holladay, Utah Paternal Grandparents; Jolynn Burdette & Kerry Little of West Jordan, Utah. Paternal Uncle; Brandon Little Maternal Grandparents; Tamara Grandstaff of Orem, Utah; Mark Raymond Grandstaff & Amy Dixon of Salt Lake City. Maternal Aunts; Ferrin Racquel Grandstaff and son Tommy Higginson, Brittia Victoria Grandstaff and daughter Jordyn Stewart. Maternal Great Grandmother; Elinor Ruth Kasenberg Smith of Cosmopolis, Washington. Paternal Great Grandmother; Margarett Candland Little of Holladay, Utah. A Memorial was held: February 9, 2019 at 2:00 pm Heatheridge First Chapel 620 Heatheridge Rd Orem, Utah 84057 with President Matt Montague presiding. Headstone for Wolfgang will be placed in Salt Lake City, Utah. Cremation was provided by Didericksen Memorial in Grantsville, Utah.